The House of Mengüjek (Modern Turkish: Mengüçoğulları or Mengücek Beyliği or Mengüçlü Beyliği ) was an Anatolian beylik of the first period, founded after the Battle of Manzikert. The Mengujekids ruled the regions of Erzincan, Kemah, Şebinkarahisar and Divriği in Eastern Anatolia in the 12th and 13th centuries. Little is known about the founder Mengüjek Ghazi. He was probably one of the commanders sent by the Great Seljuk Sultan Alp Arslan to occupy parts of Anatolia after the victory at Manzikert over the Byzantine Empire, and his principality seems to have been founded in the years following the battle. The beylik was split into the Erzincan and Divriği branches after the death of Emir İshak in 1142. The Erzincan branch was subjugated by the Sultanate of Rum in 1228, and the Divriği branch was ended by the Ilkhanate in 1277. The Mengüjek dynasty is remembered primarily for its monuments in Divriği. 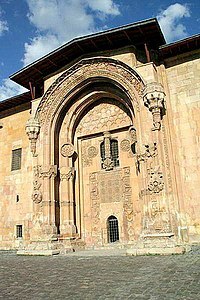 The Divriği Great Mosque was built in 1228 by Ahmed Shah. The adjoining medical center, or Darüşşifa, was built in the same year by Turan Melek Sultan, daughter of the Mengüjek ruler of Erzincan, Fahreddin Behram Shah. Both buildings are on UNESCO's World Heritage List. "Great Mosque and Hospital of Divriği". Archnet. Archived from (fact sheet) the original Check |url= value (help) on 2006-02-26. Mustafa Güler, İlknur Aktuğ Kolay. "12. yüzyıl Anadolu Türk Camileri (12th century Turkish mosques in Anatolia" (PDF) (in Turkish). Istanbul Technical University Magazine (İtüdergi). Archived from (full text) the original Check |url= value (help) on 2007-07-04. Incorporation (by sale of territories) into the Ottoman Empire under Murad I and also partially to the Karamanid dynasty. Gradual second incorporation into the Ottoman Empire under Mehmed I, Murad II and Mehmed II. Dynasty members as Beys of Ottoman sanjak of Adana until 1608.